I just wanted to remind everyone planning a trip to Lakeshore this summer to please read the “Frequently Asked Questions” page (FAQ) of our web site. You can find links in the toolbar across the top and the sidebar to the right. There you will find information about meals, housing arrangements, restroom facilities, job assignments etc. We ask that all teams planning a trip read through the entire document. We have found it also very helpful if the team leader direct every member of the trip to our site as well. The better informed everyone is, the more productive we will all be. One of the more important sections explains how we do the meals. Look under “Food” on the FAQ. We explain how every week one of the teams takes the lead in cooking. While we do not have many rules here, I do stress that we do not want any teams soliciting donations from other teams. We have several reasons for this, but at the risk of sounding alarmist, if team-to-team donations cut us out of the loop we will not have the finances to continue our relief efforts. While we do not charge anything for folks to come stay and work with us, we do assume that most teams have some sort of budget for their trip. Most teams have part of their budget set aside for a donation to the cause. If that donation goes straight to the group preparing the meals for the week, we will not have money for electricity, propane, upkeep, and overhead involved with keeping the Lakeshore operation going. Instead, we ask the cooks to utilize donated food items already present in the kitchen as much as possible and then to supplement that with purchases made from their groups budget. If the need exceeds the available finances, the church office will provide supplemental funds. We have found this method to work well so far. I hope the time we took to put together this Frequently Asked Questions page will prove helpful for you as you plan your trip to Lakeshore. If you have any other questions, please feel free to contact us. We are excited about you coming to be with us and we praise God for your generosity, dedication, and service. My son, Zack, and Mike from Seattle are hauling donated concrete blocks today. these blocks came from underneath decommissioned FEMA trailers. The contractors found it cheaper to give them to us than to haul them off for resale. We plan to use them in future building projects. I doubt anyone wants to know what I’m having for lunch, or when my wife takes our dogs to the vet, but we do have a lot of friends around the country wanting to keep up-to-date with the progress in Lakeshore. So I decided to try an experiment with another Web 2.0 technology and opened an @lakeshore account on Twitter. In contrast to the longer posts here on Rebuild Lakeshore I can post things like when a team arrives, what houses received attention today, short special needs, etc. Depending on the interest, I may even announce what the cooks are preparing for supper. A nifty feature of the system allows you to receive the short updates via text message on your cell phone, if you would like, or via your instant message client. How cool is that? Still confused? Just go to twitter.com and click the “Get Started – Join” button to sign up. Then link to our @lakeshore account and click “follow” to start receiving quick updates about the progress here. While you’re at it – share the love and tell a friend about us. 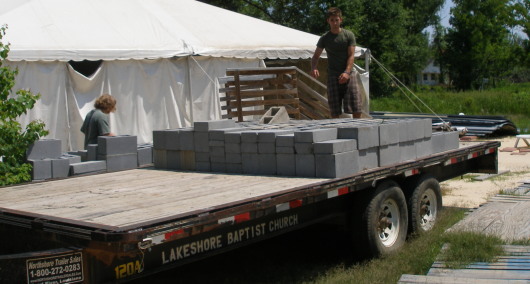 Its just another way to partner with us to rebuild Lakeshore to the glory of God. Believe it or not, with only a few volunteers on site, its quiet here in Lakeshore today. That looks to change in about a week, as the summer gets in full swing. As of now, we have 35 teams scheduled for June-July with nearly 1,500 people planning to work with us in the next couple of months. That averages well over 100 a week. The intense long days will keep us moving forward in the relief, recovery, and rebuilding efforts.. Its shaping up to be a joy-filled, work- accomplishing, God-glorifying summer. I am excited about the prospects. We hope to finish up several houses that have been dragging along in their headway. We look to begin at least three more. 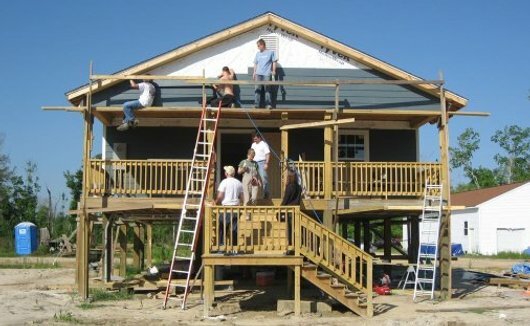 Several families will move into their new homes this summer, due to the hard work of our generous volunteers and your sacrificial support. Thank you so much. Keep us in your prayers and check the web site often to follow the progress. Our friends from Rocky Bayou Baptist Church put together this great video from their recent trip to Lakeshore. 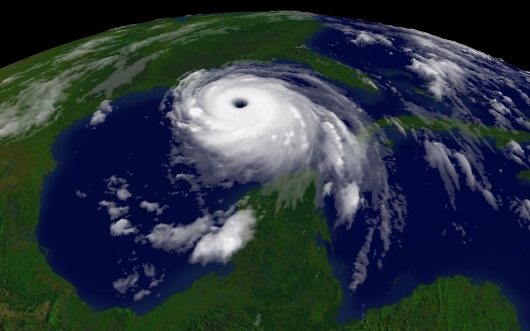 Hurricane Katrina regional imagery, 2005.08.28 at 1515Z. Centerpoint Latitude: 26:13:59N Longitude: 88:08:03W. Observation Device: GOES-12 4 km infrared imagery. See this higher resolution image. Amanda, from Michigan, reports on her mission trip to Lakeshore last month. Thanks so much Amanda. Nearly half of May has past and I have not yet posted the list of teams for last month. We praise God for the teams that worked with us in April. As temperatures rise on the gulf coast, folks in Lakeshore have been coming by our our church property looking for help with clothing their kids and themselves for the summer. The bare shelves of our distribution center have not been able to keep up with the need. At one time we had to turn away clothing, because of limited storage availability. While I’m a little reluctant to open the flood gates with a clothes request, we do need summer clothing, in good condition, to provide for the families in our community still struggling to get on their feet. We especially can use clothes for men and children, like short pants, blue jeans, short sleeve shirts, T-shirts etc. At the risk of sounding ungrateful, please do not send winter apparel at this time. We do not have space to store clothing during the summer months. We also want to be good stewards of your transportation costs and our dumpster fees, so we would greatly appreciate culling out moldy garments, threadbare pants, and shirts with holes or stains before sending them this way. Many churches have found clothing drives very successful. Set aside some space to receive donations of clothing in your facilities. Promote the drive in a number of ways. Local newspapers often receive press releases for charitable efforts like this gladly. If you belong to an SBC church, contact your association and ask if they could spread the word to the sister churches in your area. Other denominations should have similar channels of communication. In your announcement, do not forget to point them to the Rebuild Lakeshore web site (rebuildlakeshore.com). Enlist volunteers to sort through the clothes, labeling according to gender and size. Fold clothing and place them in shipping boxes. Make the sorting date a church wide event as you pray for those in Lakeshore benefiting from your generosity. Investigate the most cost effective way to transport the clothing to Lakeshore. You may find someone willing to drive the clothing down more economically than commercial shipping. If you have a team coming this summer, perhaps they could carry the boxes with them. If you do need to mail the packages, you can find our address on our contact page. Like all missionary endeavors where the work is handed off like a torch, only with hands unseen, it was taking the better part of our morning just trying to figure out where each one of us should be in order to optimize our days. If there was a frustration to be endured, then we hit pay-dirt within our first two hours! And then, of course, God came, right on time! 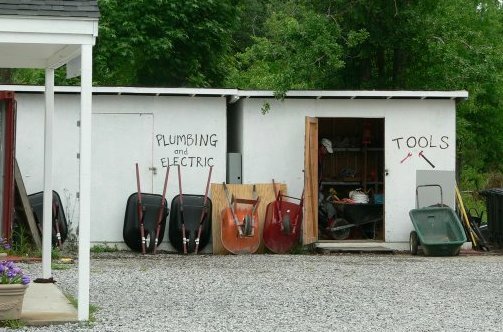 Although not all jobs were defined, some organization was beginning to surface. However, I had yet to find my niche and just as I began to speak to Jesus about this, dear Julie Robie, nudged me and suggested that maybe we could better use our time if I drove us back to the Church property – the “campus” – and prepare lunch for the entire group – 25 of us. I was grateful for a job even if it was feeding a gaggle of folk – clearly not a natural gift of mine. Anyone who knows me also knows that I’m not a cook – I often refer to this task as “fixing” something, like it’s broken! But God had plans for Julie and me, and preparing meals, cleaning out the huge refrigerator, organizing the room of cooking pots and utensils and that huge pantry, became our heavenly assignment. We even made a couple of “go for” trips for our construction team. We embraced it all, literally “dancing” through the next three days. I was hooked! I found that as Peter and I drove away from Lakeshore on Thursday afternoon, I began thinking of things we could prepare next time; Lord willing He sends us back next year and then again after that. Will He call me to the kitchen again? I don’t know, but this thing I do know, one of my sweetest memories, besides ministering alongside Julie, was meeting some of the dear ones of Lakeshore Baptist Church and having the privilege of taking a hand in mine and praying with a sister; sometimes face to face, and sometimes in her ear; just hugging and knowing that our time together was recorded somewhere beyond time, and I have been enriched and grown by their bravery. Our sisters are Miss Betty (whose home some of our team worked on), Miss Bee, Miss Lynn, Miss Linda and Miss Ruth. Pastor Don is their gifted Shepherd, and his gift of preaching evidenced itself during Wednesday evening’s Worship. We were told that this humble young man has earned two Master’s degrees and a Doctorate of Divinity degree. I’m quite sure that his formal studies did not prepare him for milling fallen trees off the Church property to be used to construct the floor of the temporary Meeting House and other portions of the standing structures that now make up the whole site. Our talented team functioned as one in God’s hand, as they worked on two homes, furthering the progress that anyone else could have done but that God reserved just for them with which to be blessed! I forgot to tell you about Margaret and Jackson Lewis. They travel regularly down from Birmingham, Alabama, to paint, install light fixtures, ceiling fans, and painstakingly collect and deliver furniture; even refinishing a piece when that is necessary to complete the look of the finished room. Margaret said to me that she never imagined that God would thus employ them in their “retirement” – they encourage me to believe and expect God to likewise employ Peter and I for His Kingdom! Peter is hooked too – albeit we both were glad that we included some muscle relief tablets in our suitcase! If you read this far, then you have indeed proven yourself sturdy – sturdy enough perhaps to join our little band next year! Pray with us for our brethren there in Mississippi. They will be rebuilding their homes and their lives for years to come. And not the least – you who filled our Prayer Chart with your promise to pray for us and for this endeavor; we are blessed to have been able to physically labor on your behalf in Jesus’ name as you also labored where God has assigned you to serve Him! Oh, let’s do it again next year! If you did not catch the link yesterday, make sure to check out the Cunningham ‘s great pictures.